An unofficial sustained American aviation altitude record for women was set on July 1, 1979, by astronaut candidate Kathryn D. Sullivan. In this historical photo from the U.S. space agency, astronaut candidate Kathryn D. Sullivan set an unofficial sustained American aviation altitude record for women on July 1, 1979, in a NASA WB-57F reconnaissance aircraft. The record altitude of 63,300 feet was reached during a four-hour flight. Sullivan, in a high altitude pressure suit, operated color infrared cameras and multispectral scanning equipment as the WB-57F spent one and one-half hours of the Big Bend area of West Texas. Piloting the aircraft was Jim Korkowski, one of the NASA Airborne Instrumentation Research Program Pilots. The flight was out of Ellington AFB near Houston. Sullivan, who has a doctorate in geology, was selected in 1978 as one of 35 astronaut candidates training for the Shuttle program. 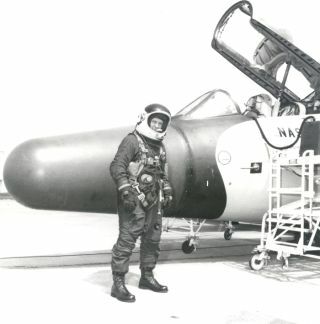 She trained to be a mission specialist and flights in the WB-57F were training in preparation for her assignments on the Shuttle. Sullivan later served as a mission specialist on STS-41G, STS-31, and STS-45.